News Flash!!! One Hundred Dollar Zoom lens does well. 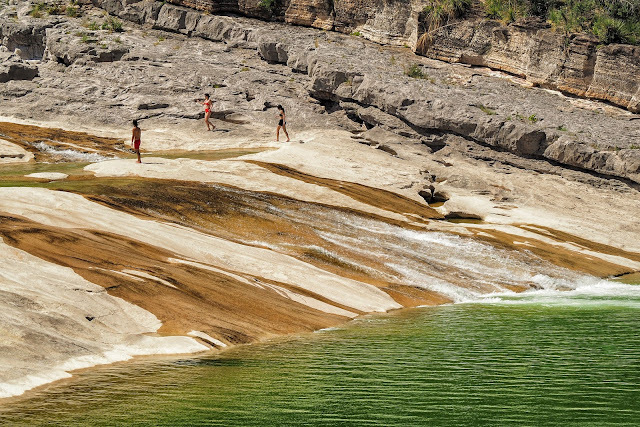 Pressed into use at Pedernales Falls State Park in an attempt to stave off boredom. The image above was done from a long distance with an Olympus 40-150mm f4.0-5.6 zoom lens, mounted on a nice tripod. 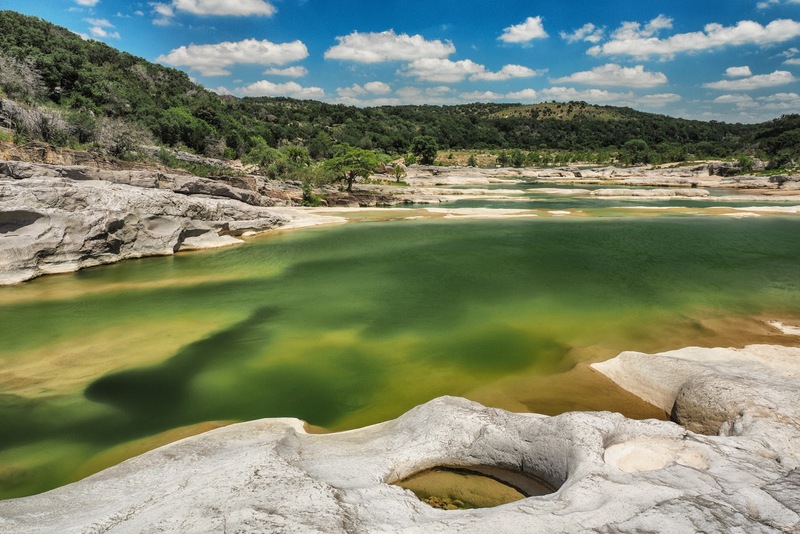 I shot it with a polarizing filter on the front to do fun stuff to the body of water on the right, lower corner of the frame. I shot at f8. When I enlarge the frame it is delightful. And I must say that everything I had with me in my backpack weighed less than the 80-200mm f2.8 lens I would have used had I been dragging a Nikon all over the place. By a long shot. An afternoon spent testing the Olympus 40 meg (and 60 meg) Hi-Res feature at Pedernales Falls State Park. Hot and crazy. I'm not much of a landscape photographer but I'm willing to fake it for an hour or two at a time if I'm trying out something different and new. That would be the Olympus Hi-Res mode out in the real world. I packed a couple of the EM5.2 cameras and two lenses. The Panasonic 12-35mm f2.8 zoom and the Olympus 40-150mm f4.0-5.6 R. I also packed a 58mm polarizing filter and three bottles of Evian water. Grabbed my straw Stetson cowboy hat, a Columbia long sleeve Sun Guard shirt and a bottle of spray on sun screen, and then I drove the 40 minutes to the park. All my gear was in a little backpack and I carried a Berlebach wooden tripod over my shoulder. I parked the car and slipped on the backpack then I headed down the steep trail to walk out over the rocks, worn and crevassed by centuries of running water. 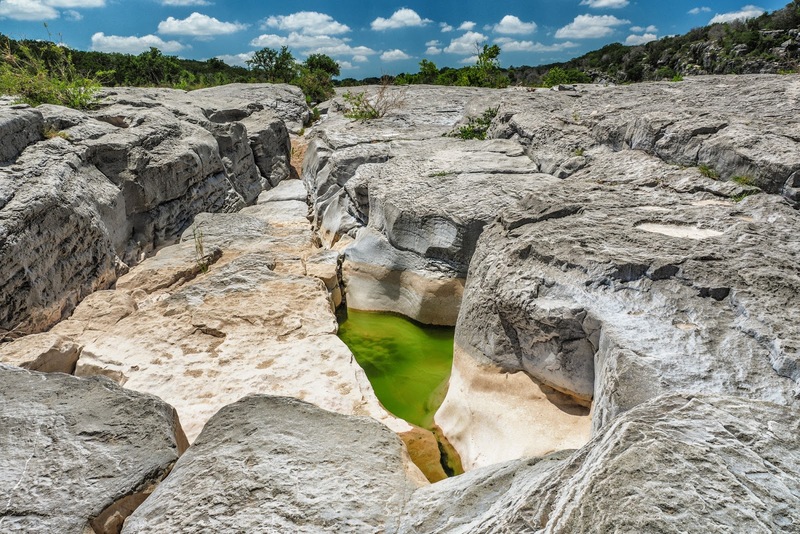 The head of the falls that bubble up from underground is a vast field of smoothed rocks that hide little pools and streams that all run together in to the Pedernales River. It takes fifteen or twenty minutes to trek down from the car and another thirty or forty minutes to find the good spots. Spots uncrowded by people dragging along coolers and screaming children. It was about 97 degrees by the time I got to the boulder field. My hat provided good protection from direct sun, as did the shirt, but after two hours of walking around, finding interesting views, setting up the tripod and comping everything up for the shots, all in direct sun, the heat just starts to wear you down. It radiates from the baked rocks and even with UV protection in all quadrants the sheer thermal load just starts to elevate your core temperature. I headed into the trees surrounding the field and drained the contents of one Evian bottle. Then I looked at what I'd gotten. I liked it. When I first started to shoot I set the camera to record in Hi-Res, in the Super fine Jpeg mode. Later I modified that by selecting the Raw+Jpeg setting. While the files jumped up from a 40 megapixel size to a 60 megapixel size I didn't see much difference in quality when I got back to the studio and could take a good, long look on the monitor at 100%. After a little break in the shade I headed down the long trail to the area of the park where people are allowed to swim in the river. It's about two miles from the Falls. I spent some time shooting there as well but I kept thinking about the walk back in the heat so I cut the photography down when I started to feel a bit off and trekked back to the car, drained another bottle of water and headed home. So, what did I discover about the Hi-Res mode in the EM5.2? First of all, being on a tripod in broad, Texas sunlight just feels so strange. It took me right back to my view camera days. You get to spend a lot of time extending legs in uneven arrangements and making adjustments to the tripod. The upside of my time spend with the "blond beauty" of tripods was that the wood is wonderful to touch even after being exposed to direct sunlight for hours. While a black, metal set of tripod legs would fry your hands the Berlebach was more or less temperature neutral. In Hi-Res mode the images are loaded with tons of real detail. They also have a different, richer color palette than images that are shot in traditional modes. But much can be done to equalize files from traditional capture and Hi-Res. To this point I have included a file from a large super fine jpeg shot in the regular mode at the bottom and I find it malleable enough to get close to the look of the High-Res stuff in terms of tones and colors. Where it is no match is in resolution. While we are mostly programmed to profess our undying love for RAW files I think in the future I'll stick to my instincts and shoot the Hi-Res stuff in large super fine jpeg. It looks great to me that way. 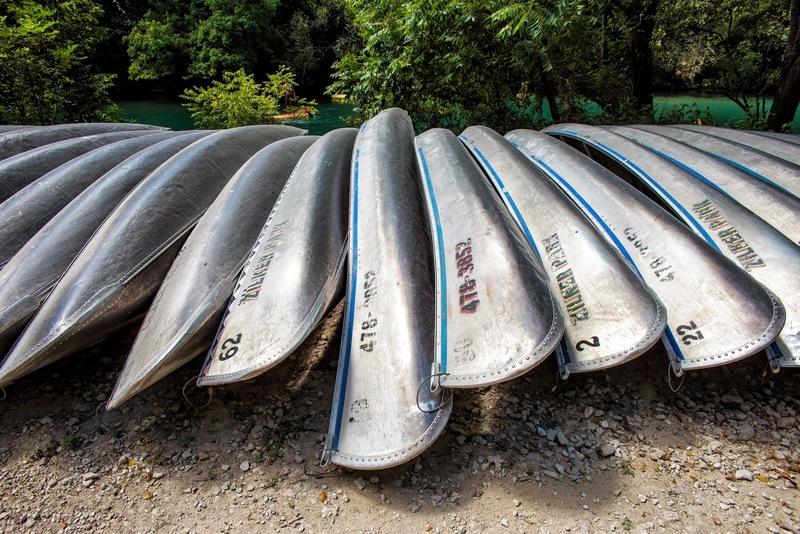 I love the aluminum canoes. They remind me of Summer camp at Camp Carter in Ft. Worth, Texas. We did an overnight canoe trip and my partner and I managed to capsize our canoe in the middle of the lake. We used what we learned in canoe class to right it but most of our possessions drifted slowly to the bottom of the lake. It was a chilly night camping out but everyone chipped in something; a shirt, a blanket, etc. and we made it through okay. The canoes above are from the Zilker Park trail that runs next to the stream connecting the pool to the city's central lake (which is really a part of the Colorado River....). Nikon D610+Tamron 20-40mm zoom lens.